It is fun and potentially lucrative to bet on the NFL MVP award winner. A lot of people are overlooking Adrian Peterson due to his off field issues. They are forgetting that he is one of the most talented running backs of all time! The Vikings lost four of nine games last season by a combined eight points! With Peterson now back in the fold and additions on both sides of the ball, Minnesota can do some serious damage. At age 30 he has nearly 2,300 total touches under his belt. However, he’s had an entire season to rest! He’s averaged nearly 1,700 total yards and 13 touchdowns in his first seven NFL seasons. If he performs similarly he could easily walk off with the MVP trophy! Tony Romo can be a very effective and dangerous quarterback. Last season with the assistance of Demarco Murray , Dez Bryant and a strong offensive line he led the Dallas Cowboys to a 12-4 record. He led the league with a 69.9 completion percentage and a 113.2 quarterback rating. He threw for over 3,700 yards with 34 touchdowns and 9 interceptions. If Dallas and Romo have another great season, he will have arrived into the elite category and will surely be a hot MVP candidate. By now everybody recognizes the extraordinary productivity of Antonio Brown. If anybody is a potential dark horse candidate for the MVP award it is surely him. Last year’s season was simply phenomenal.His 129 receptions were second-most in league history. The 1,698 receiving yards Brown put up were sixth in league history. What if he improves on these numbers? How could voters ignore him as they did last year? OMG! Phillip Rivers seems to get better with age! He put up nearly 4,300 yards with 31 touchdowns last year. Unfortunately the Chargers lacked a running game. They ranked 31st in the NFL in yards per rush at 3.3 and 30th at 80.4 yards per game. Hopefully, now that the Chargers added Melvin Gordon in the first round of the 2015 NFL draft, Rivers should have more support on the ground. Throughout history the elite quarterbacks have typically had such a solid running option to go to. San Diego is loaded in the passing game and has one of the most underrated offensive lines in the NFL. If San Diego wins the AFC West over Peyton Manning’s Broncos don’t be surprised if Rivers is getting lots of MVP love! Ewwwww! 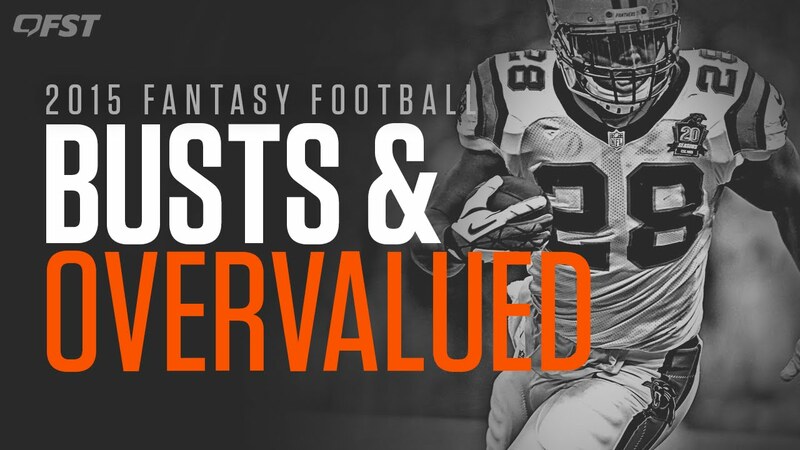 Don’t draft these fantasy busts! is visibly decreasing as well as the Broncos have actually made it clear they’re transitioning to an even more run oriented infraction this period. Of all the people on this team, Sanders has the greatest prospective to make me look dumb. Nonetheless, I required him to see a significant autumn in dream production in 2015. In fact I pretty much anticipate every person on the Denver crime to take a huge step back. concerning 90 choices later on. He’s a better value pick. and also Rex Ryan has made it clear they wish to run the round concerning 40 times a game, and also knowing Ryan, that’s possibly just a mild exaggeration. will likely still play a considerable part. Points don’t look good for Watkins or any one of the Expenses’ receivers. and also Cooper will grow into a strong duo, I just assume it’s going to take a while for the youthful pair to establish. is decreasing and also the Saints are one more group transitioning to a run-heavy crime. Hill is totally unverified, and also it’s extremely risky to simply prepare him as your leading TE and anticipate him to make also remotely close Graham. If you want to roll the dice on a man with 20 occupation functions as your starter, you’re a larger risk taker than me. , which took a ton of pressure off Romo, as well as the Cowboys made minimal effort to replace him. The team still intends to release a solid run strike with a lackluster committee. will be one more year older and also will likely continue to decline at 33. In addition to all that, Romo is still a 35-year-old quarterback with a history of severe back problems. Pass on Romo this period, he’s unworthy the price. This weekend, it’s generally Christmas for millions of professional football fans in America. That’s due to the fact that Sunday marks the opening day for yet another season of NFL football. The 2014-15 campaign in fact began on Thursday, when the protecting champ Seahawks crushed Green Bay in front of another raucous crowd in Seattle. The 30 other groups will make their debut tomorrow. Is Peyton Manning going to play like he’s 25 years old once again? Can Johnny Football live up to the hype? You’ll also discover lots of new technology on the field this season, as the NFL highlighted on Wednesday in Seattle. Thanks to a collaboration it inked with Microsoft in May 2013, NFL players and coaches will be making use of Microsoft’s Surface tablet on the sidelines between possessions. Meant to change the standard black-and-white printed documents, the device will certainly offer photos of recent plays that assist players and coaches figure out what was going on in previous possessions. Some gamers will certainly likewise wear shoulder pads with RFID tags inside their shoulder pads, which will allow the NFL to tape-record real-time position information and info connected to acceleration, speed, paths, and overall range run. There’s likewise cool technology off the field that fans can benefit from, from apps to streaming video game feeds to Twitter. We’ve rounded up some football-related tech devices and apps that may assist strengthen your NFL seeing experience this season. The NFL Mobile app. The NFL Mobile app. There are a number of NFL-related apps in the marketplace, and some are actually worth pointing out. One is a brand-new app from the NFL called NFL Now, which is largely a video hub for all things NFL. Readily available as a complimentary or paid app, NFL Now features instantaneous highlights, behind-the-scenes content, historic NFL Films video, and a lot more. “There’s never ever been a much deeper opportunity for you to obtain into our content and to our video, and to experience it the method you wish to experience it, the method you want to do it, when you wish to do it, and on whatever platform you’re on,” NFL Commissioner Roger Goodell stated at an occasion in Seattle on Wednesday. “We’re delighted about that.”. The NFL likewise has NFL Mobile, which is great for capturing up on the most up to date highlights, information, statistics, and standings. ESPN ScoreCenter is likewise another excellent one for keeping up with ratings and information. In addition, Microsoft has a good NFL App for the Xbox One and Windows 8. Other favorites consist of Bleacher Report’s Team Stream, Fanzo, Yahoo Sports, and Fox Sports Mobile. For the fantasy football players, ESPN, Yahoo, NFL.com, and CBSSports.com provide strong apps that permit users to fine-tine their lineups and inspect the current stats. NFL Sunday TIcket. NFL Sunday TIcket. If you do not have access to a TELEVISION but can get online, there are a handful of means to see NFL games. If you’re ready to pony up some dollars, NFL Sunday Ticket is your finest alternative. For $330, the DirectTV program lets you stream every out-of-market game to your mobile gadgets. There’s Verizon, which is now enabling its “More Everything” customers to enjoy live NFL video games from their mobile gadgets without paying a $5 per month fee that was eliminated this year. Verizon’s NFL Mobile likewise includes access to the NFL Network. Meanwhile, FOX revealed on Wednesday that it will certainly stream 101 games– 97 in the routine season, 4 in the playoffs– this year by means of its Fox Sports Go app. However, audiences will certainly require a cable television subscription to specific cable services and games will certainly likewise be restricted to those that are in your market. Fans will also not be able to stream video games on smart phones due to league restrictions, however laptop computers and tablets are great to go. NBC livestreams its Sunday Night games. NBC livestreams its Sunday Night games. Every Sunday night, NBC will be streaming its regular video game online for complimentary and does not require a cable subscription. You can have a look at that feed here. For Monday Night Football, fans can see the ESPN stream right here, but will need a cable television subscription. If you occur to miss a live broadcast, the NFL has a way to stream already-played games with its Game Rewind program. It’ll cost you $70 to stream each video game this season– consisting of playoffs and the Super Bowl– or you can pay $30 for access to simply one team’s replays. There are a few other alternatives, specifically for those that don’t have cable. You can try something like Aereo, which charges a small charge to stream live TV. There’s NFL Game Pass, which lets audiences from outside the U.S. and Canada stream every video game in exchange for a subscription cost. If you’re going to pay for a streaming service, I ‘d recommend simply going with Sunday Ticket. twitter-bird-white-on-blueTwitter lists are a terrific means to follow a pre-selected group of Twitter accounts, and may end up being more popular with Twitter potentially curating user timelines in the near future. For example, ESPN has a decent NFL-specific list right here. If you’re interested in the Seahawks, I assemble this list right here that can keep you updated with everything connected to the safeguarding Super Bowl champs. You can likewise produce your own Twitter lists customized to your specific NFL interests. Visit your Lists page to produce a brand-new group. Earlier this week, Sporting News assembled a nice “must-follow on Twitter” group right here, and Mashable did something comparable here. Bleacher Report likewise has a great round-up of NFL sportswriters to follow right here. There’s nothing like in fact being at an NFL video game and fans have a variety of resources online to find bargains on tickets– particularly if you’re ready to wait until the last 2nd to buy. There are the popular ones– NFL Ticket Exchange, StubHub, Craigslist– however lesser-known options include SeatGeek, Vivid Seats, Cheap Tickets, RazorGator, and TickPick. In addition, there are more recent apps like Rukkus and Gametime where you could discover a sweet bargain. One is a new app from the NFL called NFL Now, which is mainly a video hub for all things NFL. Available as a complimentary or paid app, NFL Now showcases instant highlights, behind-the-scenes content, historic NFL Films footage, and much more. The NFL also has NFL Mobile, which is terrific for capturing up on the latest highlights, news, data, and standings. In addition, Microsoft has a good NFL App for the Xbox One and Windows 8. There’s NFL Game Pass, which lets viewers from outside the U.S. and Canada stream every video game in exchange for a subscription charge.